A popular way to pick lottery numbers is to use lucky numbers that feel right to you. Many people find this more fun and more satisfying than just letting a computer quick pick your numbers. 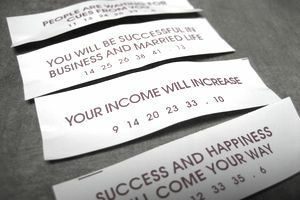 If you don't already have numbers that resonate with you, here are five ways to find lucky numbers for the lottery and for any other use. If you live in the West, the chances are that when you think about lucky numbers, the first one that jumps into your head is the number seven. According to a poll run by mathematician Alex Bellos, seven is the most popular lucky number in the world. Given its popularity, maybe it's no surprise that there are seven days of the week, seven wonders of the world, seven continents, seven seas, and many important ways that the number seven is used. Other traditional lucky numbers include three (as in "good things come in threes") and four. Remember that there's a disadvantage to using traditional lucky numbers as your lottery numbers: a lot of other people will be using them, too. That means that if your numbers do win, your chances of having to split the jackpot are high. Another way to play your lottery ticket is to go with numbers that have a personal meaning for you. For example, your lucky number might be your birthday, your wedding anniversary, or the birthdays of your kids and/or grandkids. Dates aren't the only numbers with personal meanings, though. You might also consider whether the number of kids you have or the house number of your childhood home feel lucky to you. When it comes to picking lottery numbers, dates have a similar problem as popular numbers: many people play them. On the other hand, dates often show up among the most popular lottery numbers, so it might make sense to play them, anyway. Numerology is the belief that numbers resonate in a way that gives them spiritual properties. By decoding these resonations, you can pick lucky numbers and even lucky days for playing the lottery and for other purposes. There are a lot of different ways to use numerology to find lucky numbers. One of these is to create a table with the numbers 1 – 9 at the top and one letter in each column below. So A = 1, B = 2, and so on. After the ninth letter, I, you'd wrap around again so that J = 1, K = 2, and so on. You can then plug in the letters of your name to get one digit for each letter. Add those digits together to end up with a lucky number. You can do this for your first and last name, or for the consonants or the vowels in your name. Play around until you find a combination that feels lucky to you. You can also add together the digits in your date of birth, or in any other personal lucky number until you find a number that you like to play. If you'd like to find some good lucky numbers without having to play around with numbers yourself, your daily horoscope is a good place to turn. Many horoscopes include predictions of which days will be lucky for you (and you can try playing the lottery on those days). They also include a list of lucky numbers for the day, week, or month. And don't forget that fortune cookies often include lucky numbers as well! The simplest way to find lucky numbers to play is simply to use a generator. Lucky number generators use numerology, or perhaps simply randomness, to find numbers for you. Finding and playing lucky numbers can be a lot of fun. However, remember that like all lottery systems, they don't really give you an edge in winning a jackpot. Mathematically, every number has an equal chance of being chosen as a winner. Past performance does not affect future performance. These tips are meant for entertainment purposes. Have fun with them, and never gamble more money than you can afford to lose! If you'd like some more ways to feel luckier, find out what science says about luck or read about the weird origins of some of our common lucky superstitions.